in search of bait hidden in the grass. Pogies, shrimp, mullet and crabs will all be around the vegetation. Look for grass lines along Lake Pontchartrain shorelines to be best.The optimal lure to throw on the edge of the grass is a suspending jerkbait, like the Matrix Minnow. It’s a small jerkbait that targets all sizes of trout, and it fishes best 3 to 5 feet below the surface. 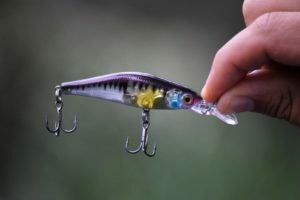 The sticky sharp treble hooks on this bait catch everything that touches them, but with the wrong rod, they can also rip out very easily.The best stick to fish this on to minimize the amount of hooks that tear out the fish’s mouth is a medium-light power, moderate-action rod. This slow tip and whippy rod will provide plenty of cushion for when a fish make lunges and runs in the grass to ensure the hooks won’t pop out.Line choice is a vital factor anglers need to keep in mind. If you want to accelerate the slow sink rate of the Matrix Minnow, fluorocarbon is very beneficial. Anywhere from 12- to 15-pound-test will get you by. If the water is high over the grass and you want the bait to run a little deeper, fluorocarbon is a must.However, if the water is at an average height, monofilament is a big player because it floats. The Matrix Minnow will slowly fall down to depth, and if you want to accentuate that, fish heavier pound tests, such as the 17-pound Matrix Line.